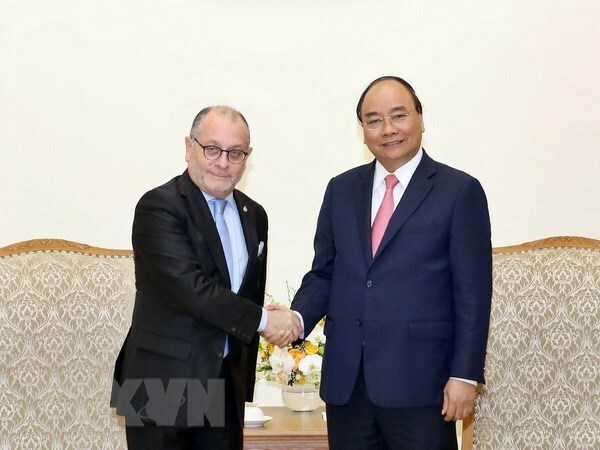 Prime Minister Nguyen Xuan Phuc has assured Argentine Minister of Foreign Affairs and Worship Jorge Faurie that Vietnam will always consider Argentina an important partner in Latin America. During a reception in Hanoi on July 31, the PM hailed the visit for opening up a new chapter in bilateral cooperation as well as the successful outcomes of talks between the two foreign ministries. He called for boosting bilateral trade and investment as the current two-way trade of 3 billion USD per year remains modest. As Vietnam currently holds trade deficit with Argentina, the host suggested organising business forums to seek new opportunities. Expressing his warm welcome for the upcoming visit to Vietnam by Argentine President Mauricio Macri, the PM hoped to boost collaboration with the Latin American country in football. He wished that the upcoming meeting of the Vietnam-Argentina Inter-Governmental Committee would be successful, raising two-way trade, and accelerating the signing of several important bilateral cooperation agreements. Faurie, for his part, said Argentine President Mauricio Macri looks forward to visiting Vietnam and also welcoming the Vietnamese PM to the country. Satisfied with the achievements of bilateral ties in diverse fields over the past 45 years, especially in politics and economy with regular high-level visits, he said both sides could work to expand their cooperative areas. According to the Minister, the working agenda between the two nations will be busy in the near future. In September, Argentina will welcome a Vietnamese business delegation to the country, where a Vietnam-Argentina Inter-Governmental Committee meeting will also be held. Briefing the host about the outcomes of his talks with Deputy Prime Minister and Foreign Minister Pham Binh Minh, Faurie said they outlined new cooperation areas, including in national defence. He also expressed eagerness in assisting Vietnam in football training and development.